Posted by B. Daniel Blatt at 8:18 pm - August 29, 2012. 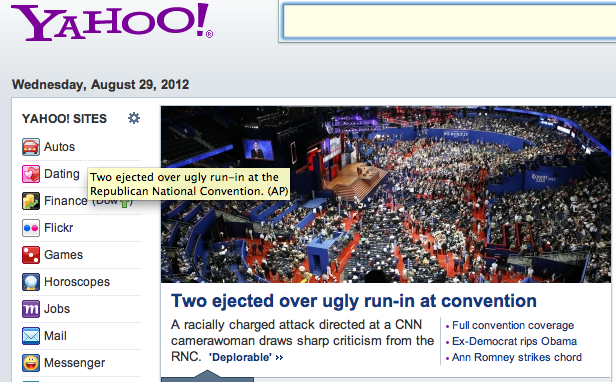 Why does the behavior of two boorish participants at a political convention mention this kind of coverage? Well, the story does fit the media narrative of a racist Republican Party. We don’t even know if the two people who engaged in what the convention organizers rightly called “deplorable behavior” were even Republicans. Yahoo News has fired Washington bureau chief David Chalian after he was caught on a hot-mic during an online video broadcast saying that Mitt Romney and his wife, Ann, had no problem with African Americans suffering as a result of Hurricane Isaac, a source familiar with the situation tells POLITICO. Posted by B. Daniel Blatt at 2:18 pm - August 29, 2012. Last night, after having dinner with a friend, we ended up, pursuant to part of our conversation, watching the first half of Excalibur, a flawed, but very (very, very) watchable movie. As a result, I missed the two “big” speeches at the Republican National Convention last night.
. . . that the electorate in November would turn to the Republican ticket because it understands better than politicians the depth of the country’s problems — and that only the Republicans would speak honestly about them and the need to change course before it’s too late. Perhaps, the reason Christie highlighted his own record was to show that understanding and that even thought Republican leaders in state houses across the country face incredible obstacles to reform, but are nonetheless pushing ahead with solutions to their jurisdictions’ problems. Christie’s goal, in short, was to warm up the audience for Paul Ryan, showing that Republicans have solutions to the nation’s fiscal problems. Posted by B. Daniel Blatt at 1:50 pm - August 29, 2012. Would Barack Obama enjoy the adulation he does among veteran journalists and Democratic partisans if those journalists treated him like they have such Republicans as Todd Akin, Sarah Palin and former Vice President Dan Quayle? Every time one of those individuals misspoke, our national news media highlighted the gaffe as if it were a defining moment in American public discourse. And in so highlighting it, they often did make a defining moment in our media-saturated culture. Quayle’s mind must have been on other things. It wasn’t like he repeated the mistake in all 57 states, or more precisely in Beaverton, Ore., in May 2008; or while traveling on the “Intercontinental” railroad in Cincinnati on Sept. 23, 2011; or perhaps, while he was speaking to the “President” of Canada in Chicago on Aug. 7, 2007. He might not have known how to say it in “Austrian” while in Strasbourg, France, on April 5, 2009; or perhaps he was thinking of “Polish Death Camps” at the White House on May 30, 2012; or thinking about when he met with world leaders in that splendid “Asian” city, Honolulu, on Nov. 16, 2011. It seems that if a Democratic politician makes repeated gaffes, those gaffes don’t make a sound to the legacy media. Posted by B. Daniel Blatt at 1:36 pm - August 29, 2012. Gay Patriot – Why do some Americans who favor ‘smaller government with fewer services’ continue to back Democrats? Posted by B. Daniel Blatt at 3:34 am - August 29, 2012.
. . . shows that half of registered voters think that Mitt Romney does not understand their problems, reflecting an empathy gap with President Obama as Romney prepares for his acceptance speech at the Republican nominating convention. Only 41 percent of Americans said Romney understands their needs and problems, compared to 54 percent who feel Mr. Obama understands their needs and problems. And this is not the only survey to show what CBS writers dubbed an “empathy gap.” Perhaps, the reason is simply the stories the news networks tell. The incumbent is cold, often aloof. Mitt Romney while sometimes awkward in public has a long record of helping neighbors and friends in need. It’s just that he doesn’t boast about it. When I asked at the beginning of July if Obama had ever (personally) helped individuals in need, no reader could come up with a single example. Maybe Obama did help out at one time or another, but the stories aren’t easy to track down. Posted by B. Daniel Blatt at 2:55 am - August 29, 2012.